Among the many changes in the Big Sky Conference are the addition of North Dakota and Southern Utah. Many followers of the Big Sky don't know much about the teams, so I thought it would be good to start to get to know them. Let's start with each team's best player (who, by the way, is eligible for the Big Sky Newcomer of the Year Award). Today, we will focus on Troy Huff of North Dakota. He will be a junior this year, and will enter the season with 872 career points. 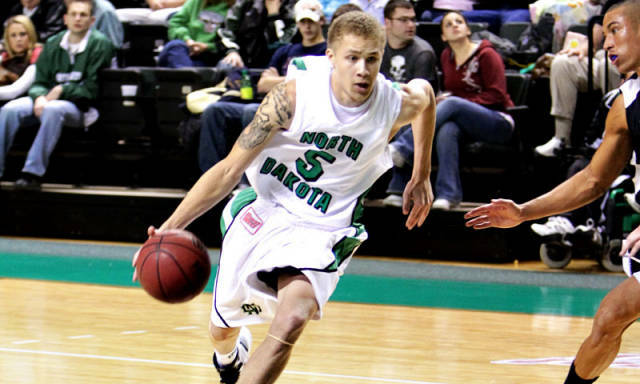 He has been the man on UND since the time he started playing, and will be the key determinant in whether UND can seriously challenge for the Big Sky title in their first year. Of course, the rough numbers in his sophomore year are mostly driven by that really bad three-point shooting percentage, because he took a lot of threes. He took 118 treys, but made just 19 of them, for a measly 19.5%. Since he shot 33.3% as a freshman, it seems unlikely he will make only 19.5% of them, but it would be prudent for him to live inside the arc a little more. Not everything was worse about his sophomore year, as he made other improvements across the board. He became a better rebounder, and snagged 5.9 per game with a 17.2 DR%. Of course, some of this was partly due to the lack of size on UND's frontcourt, and they should be improved in this area, which means he hopefully won't have to rebound as much. He improved his assist rate, to a respectable 16.3%. Even though he controlled the ball a little more, his turnover rate went down a bit, and it wasn't that high to start. He got to the line more (though he needs to improve that percentage, as he shot just 62% from the stripe). He became more opportunistic defensively, and had an impressive 1.6 steals per game. The bottom line is this... he has the talent to be an all-conference talent, and perhaps even a conference player of the year at some point during his final two years. He is that good. But, he needs to improve his shot selection (or get back to his freshman year percentages, and he needs to become a better free throw shooter. For comparison sake, if he shot 33% from downtown, and 70% from the free throw line (a reasonable jump), here is his stat line compared to Kareem Jamar, who is without argument one of the best players in the conference. Jamar is still the better player, but they are not that far off. If Huff improves in those areas, UND is a potential top 4 team in their first season in the Big Sky. If he doesn't, it will be a battle for them to make the conference tournament. He is their best and most important player. Got a chance to see Huff play down at Air Force last year. I believe Huff is a better player than Jamar. Jamar is definitely a better shooter, but Huff is the complete player. Looking forward to the UND vs. Montana game in my hometown, Missoula! Should be a good one!